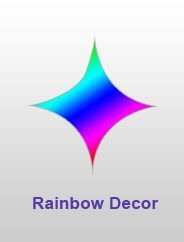 Fill your stage, set or party room with rainbows of colors with our multi-color lighting and event Decorations from ShopWildThings. Show off cascades of colors with our floating confetti curtains, beaded hanging columns and rainbow bead curtains. These rainbow event Decor items cover the complete color spectrum for bold and beautiful party design. Create room dividers or colorful backdrops with multi-color iridescent beads in the shapes of hearts, dolphins, stars and moons or raindrops. Shop our rainbow-colored string curtains and party garlands. Rainbows of colors twinkle from our iridescent chandeliers ranging from 2 feet to 3 feet in length. Use our remote control-compatible LED lights to create color-changing light shows with tabletop fixtures or submersible multi-color light sets that can be placed inside clear vases or bowls. For indoor tabletops and outside decks, we also have colorful faux gemstone candleholders with rows of turquoise, red, purple, amber, orange, pink and green acrylic beads. Our 10-inch battery-operated waterproof LED light ball with seven colors can be floated in a backyard swimming pool or outdoor fountain. Create a playful look with our light-up balloons in white, yellow, pink, green, blue and red.